Submitted photo Baked garlic Crab. I am a huge fan of crab legs. I’ve eaten blue crabs in Maryland from the Chesapeake Bay. In fact, I worked at an amazing restaurant while I lived in Maryland. Crabs were our specialty. Jimmy, the owner, plucked the crabs from the ocean himself. He and his sons would get up early and cruise out into the sea. Several hours later, they returned with buckets of crab, which were served throughout the day and night to satisfied customers. Living in Maryland and working at this crab restaurant made me somewhat of an expert in picking the meat from the shells. After work, the other servers and I would sit around, counting our tips, drinking a beer, and eating crab. I only worked there for one season, but within that short amount of time, I gained a lifetime of experience in shelling crab. By the time Claud and I were married, we lived in California. We didn’t have a lot of money to go out to crab restaurants. So, to get our fix, we bought bags of crab legs in the frozen section of the grocery store. We usually bought snow crab because they are fairly affordable. By the time Daphne and Jack were about five and four, respectively, we discovered that they preferred the crab to the chicken nuggets or ravioli they usually ate. This was unfortunate. This meant our crab budget just doubled. Luckily, they went to bed at seven and we could feed them early. Then, after they were sound asleep, sometimes we had a private crab dinner. This went on for a while until Daphne saw the opened and empty package in the trash one morning. She burst into tears. We felt so bad. We never did that again. Our favorite sushi restaurant served something called, “King Crab Special”. It wasn’t on the menu. I had been going to this restaurant since I was about seven years old. Sadly, it is now closed due to the owner’s son selling drugs out the back door. It’s a very sad story. But, that King Crab Special was beyond amazing. He served the crab three different ways. One section of the plate contained regular steamed crab with drawn butter. The second section contained crab with avocado dipped in tempura batter. This came with a ponzu sauce. The final portion had crab baked in garlic butter with a small dish of more garlic butter. I haven’t had anything close to this dish since the restaurant closed a few years ago. Then, a couple of weeks ago, Claud and I were at a restaurant in San Francisco on the side of the ocean, eating lunch. I heard from several people that it was crab season. Crab was all I could think about. Since this was a restaurant in Fisherman’s Wharf, filled with tourists, I knew they must have crab in the menu. I was right. I struggled with the decision of choosing crab or clam chowder as my starter. I eventually went with clam. I decided you couldn’t go wrong with clam chowder. Again, I was right. This clam chowder was incredible. I love the creamy broth and bits of potato. I always have to have a sprinkle of fresh ground pepper on top to make it perfect. For my main course, I ordered the crab legs baked in garlic butter. I couldn’t wait. I hoped they were as good as I had in the sushi restaurant. With that thought, I looked out over the water and saw Alcatraz in the near distance. I hoped the owner and his son were doing okay and that that entire drug selling business was a thing of the past. Then, my crab arrived and all thoughts of anything not crab related vanished from my brain. It looked incredible and the smell of garlic penetrated my nostrils. The waitress tried to put a plastic bib on me. I said, “I definitely don’t need that.” She jokingly asked if I was an expert. I told her I actually was. This was no joke. Soon, I dove in. I picked every speck of crab meat from those crab legs and didn’t have a bit on me anywhere. These were in fact as good as the sushi restaurant. I was so happy. I loved the sweet crabmeat mixed in with tons of melted garlic butter. They obviously knew what they were doing. I barely spoke to Claud as I worked my way through the legs. He was surprised when I offered him a bite or two. It reminded me of the time we were at the seafood buffet at Jackpot Junction when he had to walk outside because the amount of crab legs being consumed around him and the rate at which it was being eaten sickened him a bit. I still laugh at that, especially when I remember the look on his face as he picked a tiny piece of crab out of my eyebrow. I am not going to apologize for my love of crab. Preheat oven to 375 degrees. Melt butter in a small saucepan. Add garlic. Squeeze in the lemon juice. Sprinkle in salt. Whisk in the olive oil. 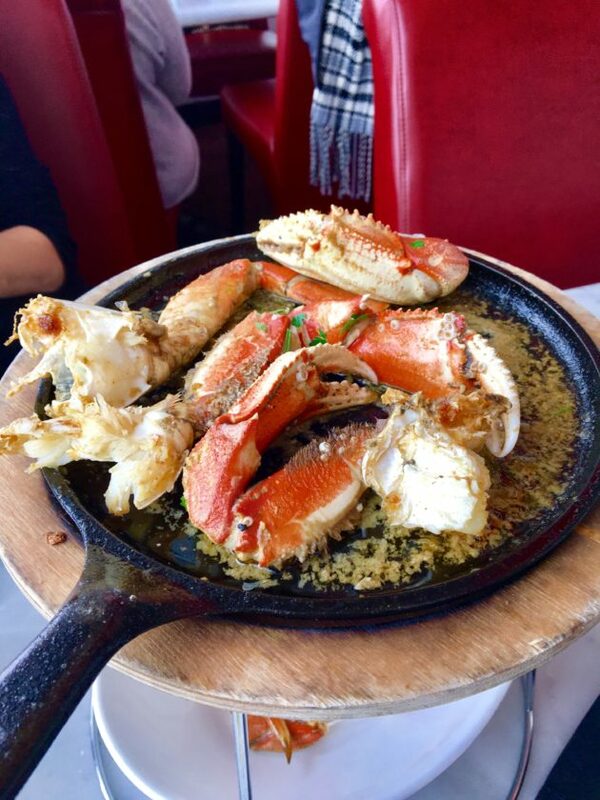 Place crab into a baking dish. Brush each leg with the butter mixture. Bake for 25 minutes. Place the remaining butter into a ramekin for dipping.